There was no warning. It happened in the middle of the night. A city was cut in two. Gerta’s family was cut in two. Many families in Berlin were cut in two. Gerta’s father and middle brother had gone to West Berlin to look for jobs and an apartment for the rest of the family one September day in 1961. 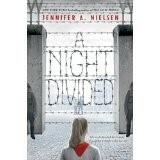 That night, East Berlin border guards were ordered to build a barbed wire fence. No one was allowed to cross the fence. Within days, a wall was built with barbed wire atop it. East Berlin was shut off from the rest of the world. Food shortages, work shortages, and brutal interrogations of citizens followed. One day, on her way to school Gerta saw her father on the other side of the wall pantomiming a song about digging a garden. Later, it occurred to her he might be suggesting she build a tunnel under the wall. The story is tense, fast-paced and very accurate. Grade five and grade six readers will get a realistic, if frightening, look at part of the past. Teachers and librarians will fulfill the core curriculum standards in history and literature by including this book in their reading lists. It will open discussions of freedom as well as open doors to further research. Some of the students may be able to find family members or neighbors who lived through the experience. Students will be awestruck at how many people did not live through it.